Beer Tasting App - the great new platform for beer rasting and beer lovers. The Beer Tasting App is a great new platform for beer rating and a must have for all beer lovers, beer fetishists, beer fans and beer connoisseurs. Beer newbies are of course also welcome here – we happily welcome every new member of our community. With the comprehensive Beer Tasting App, you’ll dive right into the world of beer and learn everything you ever wanted to know about this liquid gold. There are thousands of different types of beer in the world, and each one is different. That’s just one of the many reasons why beer never gets boring. You’ll always find a new one to try and especially on a warm summer’s evening, there is nothing better than a cold one after work. 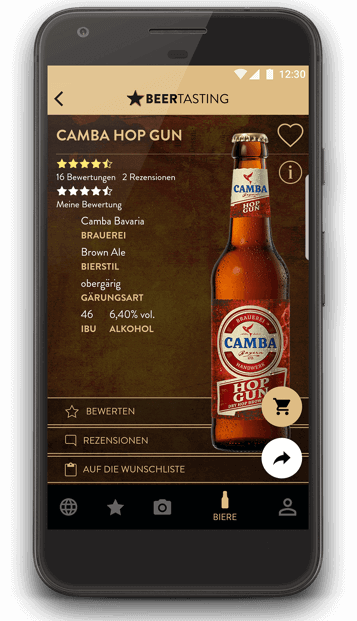 With the Beer Tasting App, you’ll be able to rate the beer you’re drinking, find out about varieties you’re not familiar with yet, share your opinion with the community, see with beers have the best ratings and more. In short, the Beer Tasting App makes beer tasting and getting to know new varieties even more fun than ever before. It’s easy and straightforward to get information about individual beers and you’ll be able to remember every beer you’ve tried. Further, the Beer Tasting App gives you the chance to rate your favorite brews and share your opinion with the community. Another benefit is, that you won’t accidentally try a type of beer you didn’t like twice. Instead, you can fully devote yourself to your favorite varieties – which you won’t be able to forget, all thanks to the Beer Tasting App! Save all the types of beer you’ve tried so far. Here you’ll find all beer-related events in your area. Scan a beer label and receive all information on it. What do you think? Share your opinion with the community. Find out more about where your beer was brewed. Search for specific beers, styles or regions. Scan the label on your beer with the camera on your phone. As soon as you scan your beer label, the Beer Tasting App will show you what you need to know about your beer, such as what brewery it comes from and what type it belongs to. Share your opinion with a like-minded community, rate individual beers and discover which beers are especially popular right now. Download the Beer Tasting App and rate your beer in just a few easy steps. This way, you won’t forget which beers you’ve already tried. You want to share your opinion with the community? Publish your rating! Drinking beer is one thing above all: fun! Even more so, if you try different types of beer from all corners of the world with your friends. Find out which is your personal favorite. 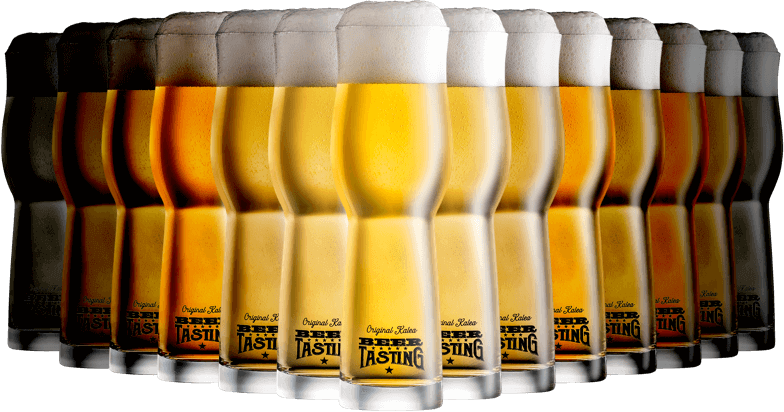 Choose about 5 or 6 different kinds of beer for your tasting. The tasting will be most varied and interesting if you choose several different styles of beer, since this is how you’ll get to know the differences. Make sure the beer isn’t too cold, otherwise you won’t be able to taste much. A good rule of thumb is: if your beer has 8 percent alcohol, do not drink it below 8 ° C.
The best glasses to use for your beer tasting are bulbous glasses that open up at the top. This shape, the so-called “beer tulip”, is probably the most popular when it comes to beer glasses, as it allows for an intense development of flavor and is suitable for a great variety of different beers. To complete the experience and to keep your stomach happy, simple, salty snacks such as crackers, chips, peanuts, baguettes, pizza or cheese bits go well with almost any type of beer. We hope you enjoy the tasting! WHO BREWS THE FINEST BEER IN AUSTRIA? How can I tell my absolute favorite beers apart from the rest I’ve tried? You can easily mark your favorite beers when rating via the pop-up button at the bottom of the beer bottle photo. You can then find them in your personal beer cellar. How can I delete a beer from my personal beer cellar? This feature has not been integrated into the app yet, but is scheduled for one of the next updates. The beer I’m enjoying right now is not in the app. What can I do? That’s easy! Go to the beer search and just tap the pencil icon in the top right hand corner. 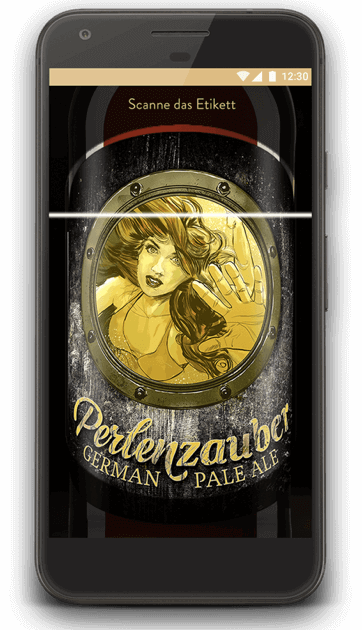 Then fill in the form (name of beer, brewery and alcohol content MUST be given, the rest is optional), photograph the label (ideally a nice, parallel frontal image of the bottle – also optional). Once you’ve done that, just tab “submit now”. Our hard-working staff will process your beer as soon as possible! Once that’s done, you’ll receive a push notification informing you that the beer you’ve entered is now online. Why doesn’t my beer scan work? 1. The position of the bottle: You should make sure that the camera and the label you want to scan are parallel to each other. How can I log out of the app? To log out, tap the settings icon in the top right hand corner of your profile screen and just press “log out”. Unfortunately, changing your password is not possible in the current version yet, but this feature will be available with one of our coming updates. What to do if I’ve forgotten my password? If you have forgotten your password, you can click on the “forgot password” button in the login area, and a randomly generated password will be sent to your e-mail address within 2-3 minutes. How do I create my BeerTasting.club account? Tap the “personal area” icon on the bottom right side of the home screen and enter your details to create your personal online account. You can either register with a valid e-mail address and a password of your choice, or simply via Facebook. What are the requirements for using the Beertasting.club App? Do I really need a BeerTasting.club account to be able to use the app? You do not need a personal account to use the basic BeerTasting.club app functions, such as the beer scan, the beer search, or the news and stars sections. However, we do recommend that you set up an account, since you won’t be able to rate beers (which are then automatically saved to your private beer cellar), write reviews or add comments.